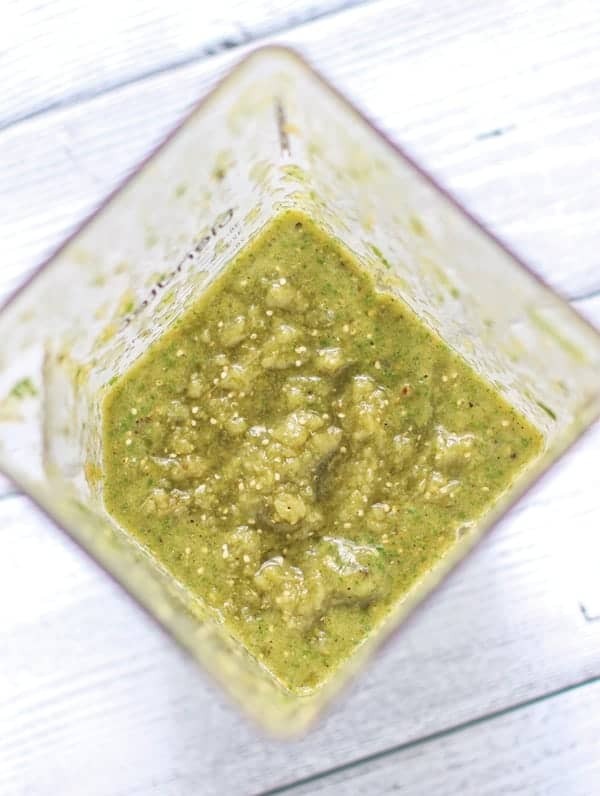 A simple tomatillo salsa using smoked tomatillos and made in the blender. A delicious topping for sausages, chicken, or simply with chips. This past weekend we (over at Ember and Vine) catered our biggest event to date. 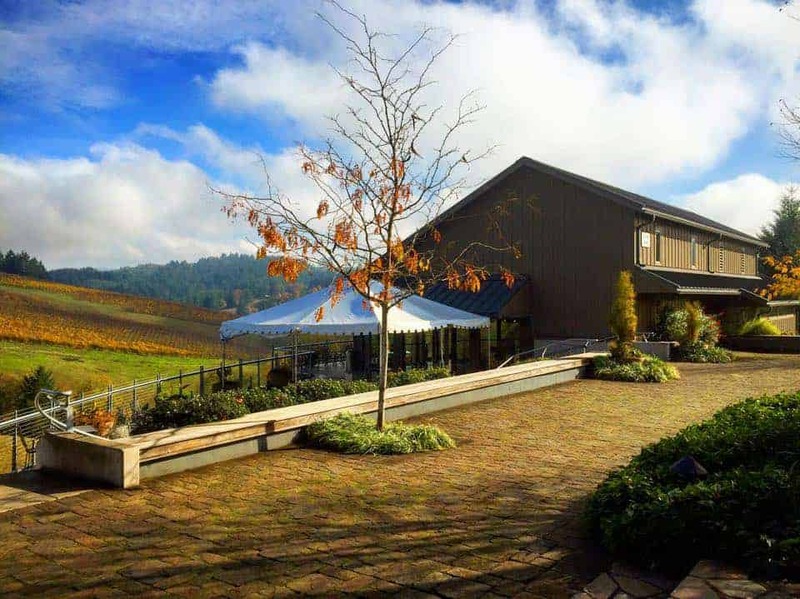 Despite the pouring rain, Willakenzie Estate’s “Pigs ‘N’ Pinot” Party brought in over 400 people to sip on their delicious lineup of wines and nibble on all things smoked pork — pork that our team at Ember and Vine had the honor of cooking up! Wow! What an event. I hardly took any pictures because we were too busy prepping, cooking, and serving. 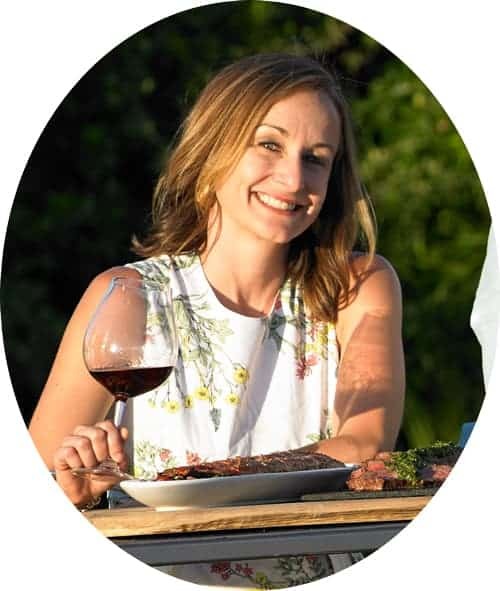 We were approached with the idea of creating four appetizers to pair with four of Willakenzie’s wines, all focusing on pork. Oh yeah! Smoked Pork Tenderloin with Gamay Noir Reduction Sauce and Crème Fraiche paired with Willakenzie Gamay Noir. Smoked Pulled Pork Sliders with Pinot Noir BBQ Sauce paired with Willakenzie ‘Gisele’ Pinot Noir. This is the kind of thing we live for — pairing delicious wines with our food! We had a blast coming up with these recipes. We’ll have the soup recipe up next week, but today I wanted to share the recipe I’ve been waiting nearly a year to post. Earlier this year we partnered up with Executive Chef Adam Ruplinger, who makes some of the most amazing sausages I’ve ever had. Now if you were to tell my 10-year younger self that I would be raving about sausage of all things (something I never enjoyed, ever! ), I would have laughed in your face and gone back to eating my tofu stir fry. But, oh my, things have changed. Thanks to Chef Adam and his Lil’ Chubby magical sausages. 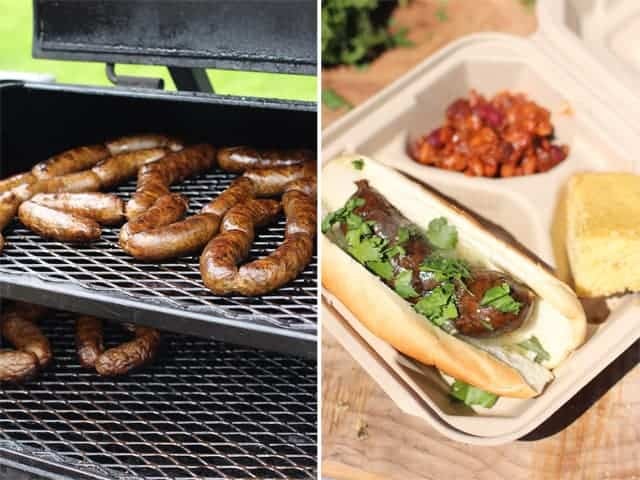 We’ve cooked up these sausages at a few events, and they are always a hit! Maybe we will write up the recipe someday but trust us, this savory sausage is not meant for mustard or ketchup. No way! Instead we top it with a salsa that balances out with some of the herbs and spices found in the sausage. 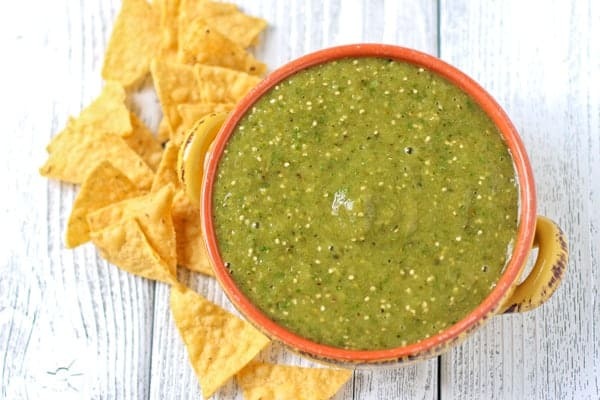 This Smoked Tomatillo Salsa. 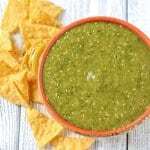 This salsa is not just a fantastic topping for sausage, it’s also an incredible marinade for chicken, and it’s great on top of tacos, served over your breakfast eggs, paired with flank steak, or just served with some chips. It’s incredibly versatile, and incredibly delicious. It’s also incredibly simple to make! Just throw it in the blender and pulse away. Some people have told me they’re intimidated by tomatillos. There’s nothing to worry about. These little guys look a little like gooseberries with their outer husk, but they are from the tomato family. Once you remove the inedible husk on the outside they look just like green tomatoes. Once you cook them they become juicy and sweet. And when you smoke them, they’re magnificent! This past weekend, I made GALLONS of this stuff! It’s time to share the love here on the blog. To start, just remove the outer husks and discard them. Then rinse the tomatillos and quarter them (you can just half the smaller ones if they’re cherry tomato size). This will maximize the flavor potential when they’re on the smoker. 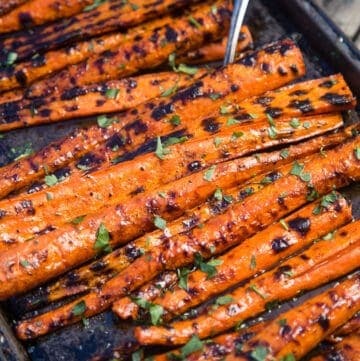 Place them on a foil-lined cooking pan, or baking dish. You’ll want to catch the juices that start to seep out, so make sure it’s a tray that will collect any juices. Then place them on the smoker set to around 275 degrees for about 90 minutes, or until they look soft and roasted (they will turn a darker color). 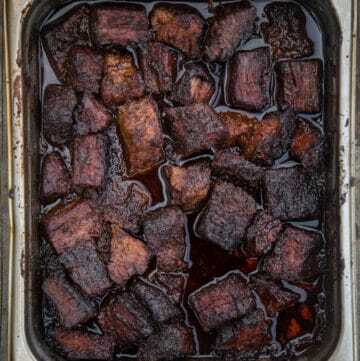 Remove them from the smoker and place in the blender. Add some chopped shallots, apple cider vinegar, cilantro and some salt and pepper, and give them a pulse. 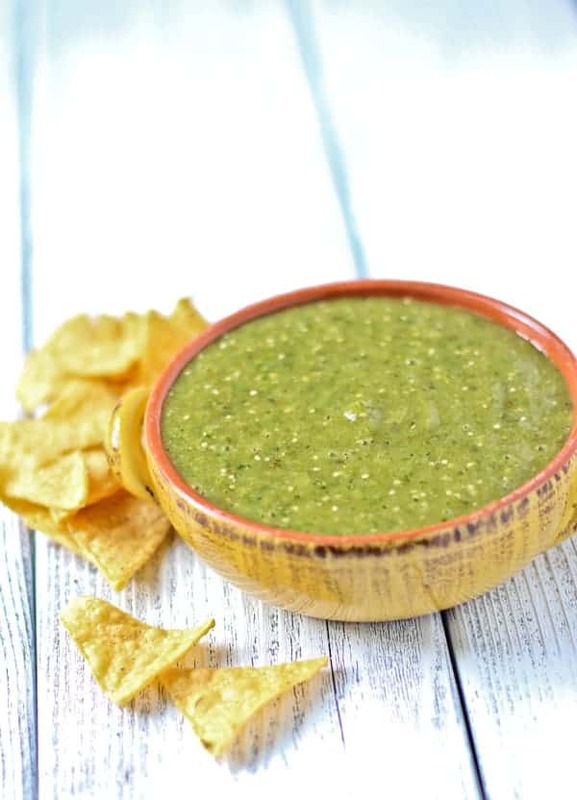 The taste of this salsa is a bit different then the flavor profile you’ll find in most jarred Tomatillo Salsas (often called Salsa Verde). 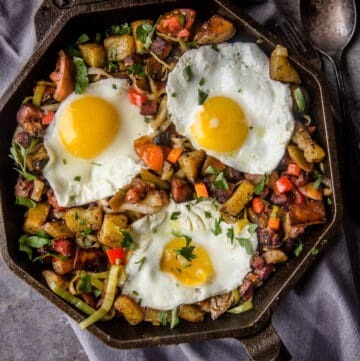 It’s a mix of sweet, savory, and smoky. 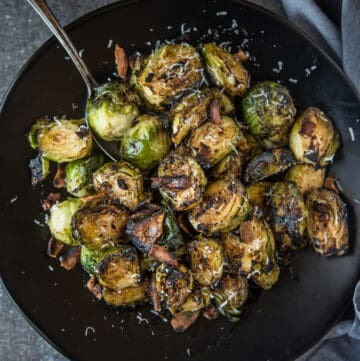 We balance the smoky flavor of the tomatillos with apple cider vinegar to give it a nice bite. If you’re not a huge fan of vinegar, just go light on it and add it a tablespoon at a time until you get to the flavor you like. 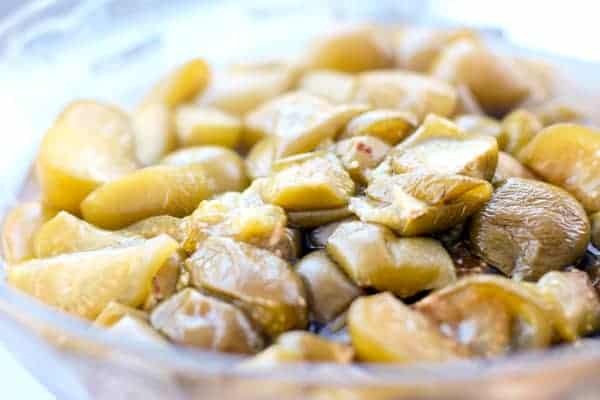 The tomatillos should be sweet enough, but if you like you can always add a teaspoon of sugar just to bring out the flavor more. After about a day in the fridge the salsa may thicken up and look a little gelatinous. Just add a little warm water (or more vinegar) and mix up and it will go back to normal. 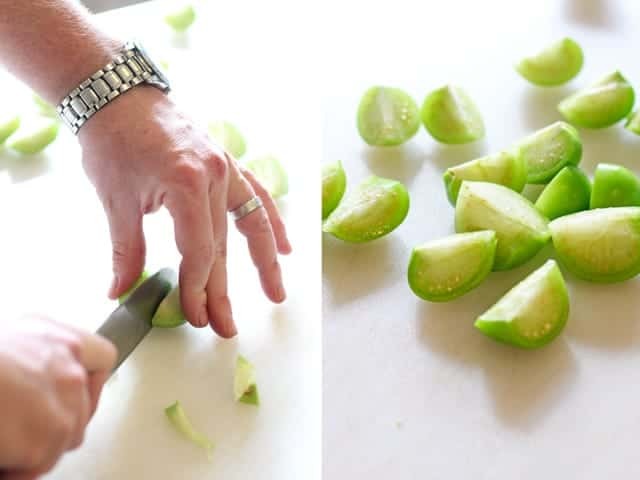 Rinse tomatillos, and cut into quarters. 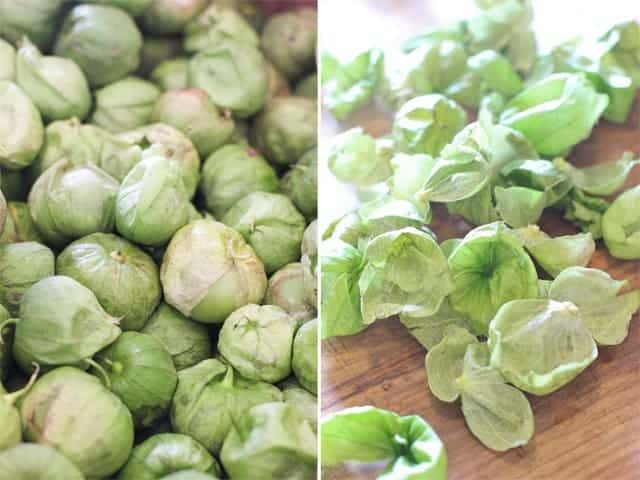 Place onto a sheet pan and lightly sprinkle 1 teaspoon salt and freshly cracked pepper over the tomatillos. 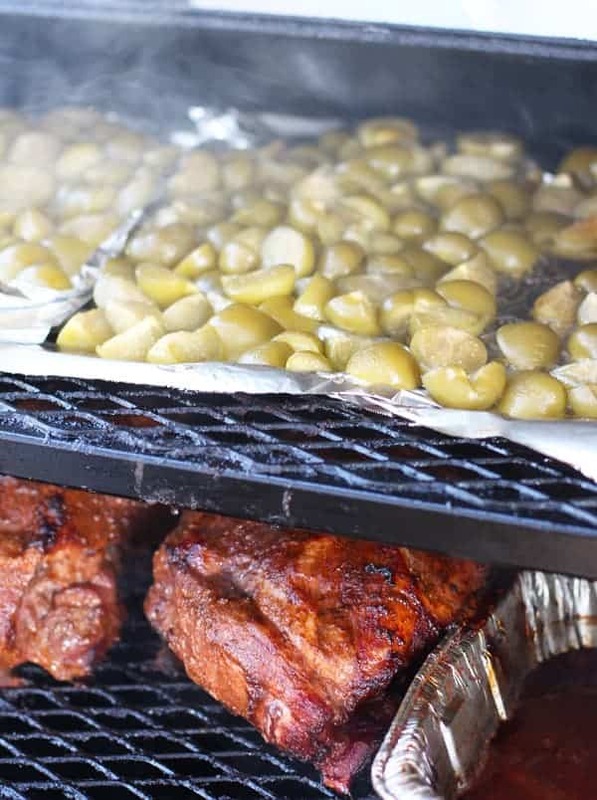 Place tomatillos onto smoker for 90 minutes or until they look soft and roasted. Place the smoked tomatillos and any juices into a blender or mixer while still hot. Add diced shallots, apple cider vinegar, cilantro, 1 teaspoon salt and mix. For less acidity, add water until desired flavor, for more acidity add more apple cider vinegar in small quantities. Serve over your favorite sausages, or meats. 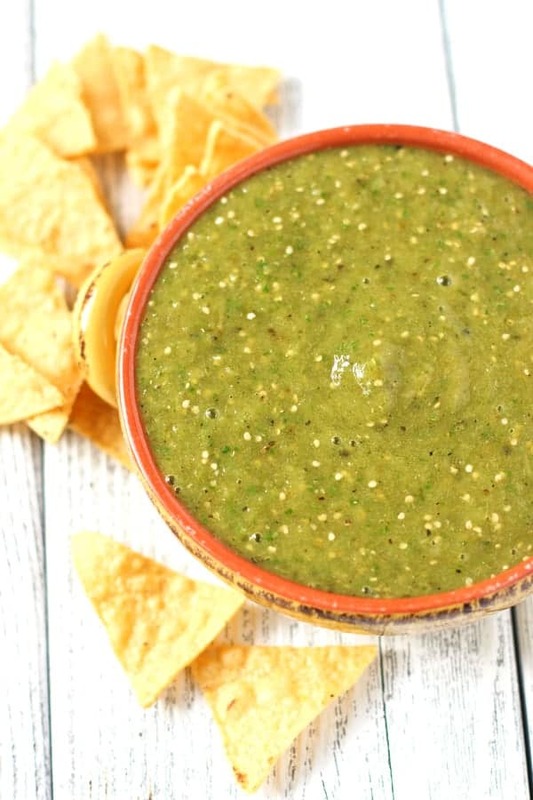 Salsa may thicken up after sitting in the fridge overnight. 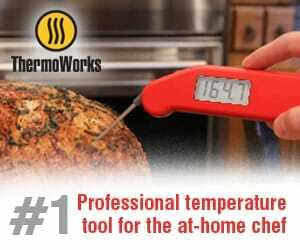 Just warm up again and add a tablespoon at a time of water or apple cider vinegar. 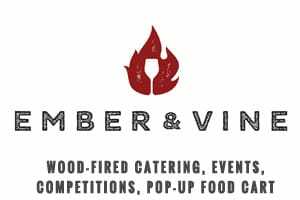 For more info on our sister company, Ember and Vine, or if you are interested in a wood-fired catering event, check out our website. delicious! the consistency looks perfect, i love the hue, and i imagine that it tastes just amazing! Thank you!! And it is pretty amazing! Especially on those sausages. Gaaahhhh!!! Wow, how does one cook for 400 people? I can’t even cook for 10. :p The salsa looks delish. 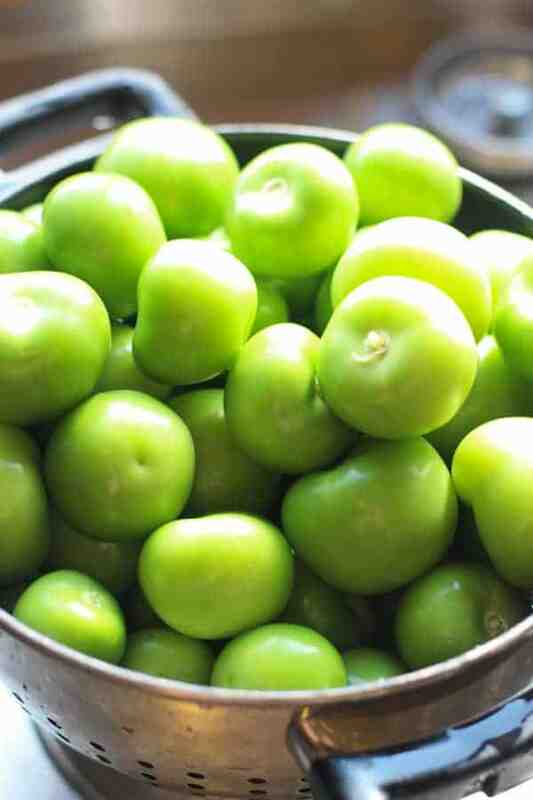 I’ve always thought that salsa verde was made from GREEN tomatoes… until a friend of mine told me about tomatillo. I need to try to make em! Ha!! 400 people is definitely A LOT! But we have a great team that helps out and works incredibly hard! I love them now. Love love love!!! What flavor of wood did you use for smoking? I made 2 double batches of this salsa tonight and it is amazing! I was wondering if it can be home canned and if so, how? If you have suggestions, I would like to know how long to process both pints and 1/2 pints please and if anything else would need to be added for properly preserving it. Or would you recommend freezing it instead? Hi! So glad you like this!! Though I’m the worst person to ask canning questions to! It’s my goal one day to learn all about canning, but at this point I usually make it to freeze or refrigerate and eat within a few days. If you do experiment with canning please give me all your feedback so I know when I’m ready to venture into that area. Until then I usually just freeze extra. Wish I could be more help! I have another question. I know that vinegar is important as a preserving ingredient when canning. I only used half the amount called for and it tasted perfect. Would I need to add the full amount for proper preserving? I like this recipe except for the vinegar. My batch was too vinegary and I had to add a bit of sugar, water, and honey to partially save it. I also added a smoked pablano (no seeds). I recommend going lighter on the vinegar to start and adding to taste. Armando that is great feedback and more important, we love that you improvised to get the flavor you were looking for. 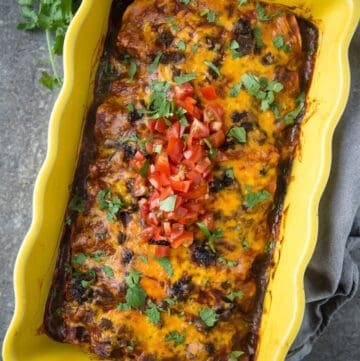 Love the poblano idea!! !